Artistry is a quirky thing – it is the ability to see and do things in a very different way than most other people. The Right Reverend Billy F. Gibbons is an artist. He plays the guitar like no one else – known for his many accolades as lead guitarist and singer for ZZ Top. These days, whenever and wherever BFG straps on a guitar, you know it will be memorable and stick in your head forever. The question is, does artistry transcend to multiple facets in one’s life. For Billy F. Gibbons the proof that it does lies in the hot rods he has designed and had built over the last 20 years. 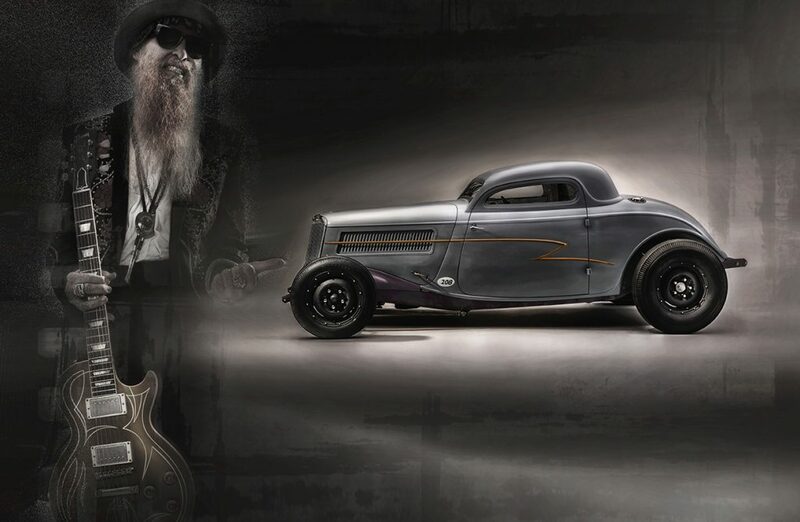 Billy’s “second channel” of brilliance surfaced with the ZZ Top “” Eliminator” ’33 Ford coupe that graced both a ZZ Top album cover and the cover of Hot Rod Magazine. Initially, many of us in the press discounted BFG as just another rich guy getting high-dollar cars built for him. But there was something about that car, that just got you – the stance, the graphics, the proportions – whatever it was, it was Billy’s artistry coming through. If there was any doubt about Gibbons’ influence on the cars he builds, it was put to rest with the debut of his custom Cadzilla and the “Dare to be Different” movement it inspired. Along the way Billy gathered “kindred spirits” like the late Pete Chapouris, Jimmy Shine and a host of car builders who saw hot rods the way he saw hot rods. 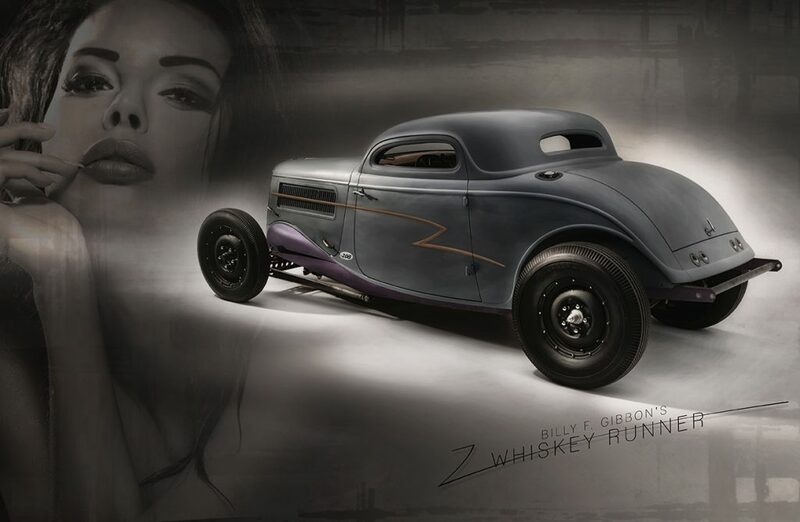 There have been other cars added to his stable, but his latest coupe, a ’34 Ford three-window coupe that he’s named “Whisky Runner” has captured the total essence of a ‘50s hot rod like no other. This coupe is significant in many ways. It has a perfect 5-inch chop performed by previous owner Rudy Rodriquez. 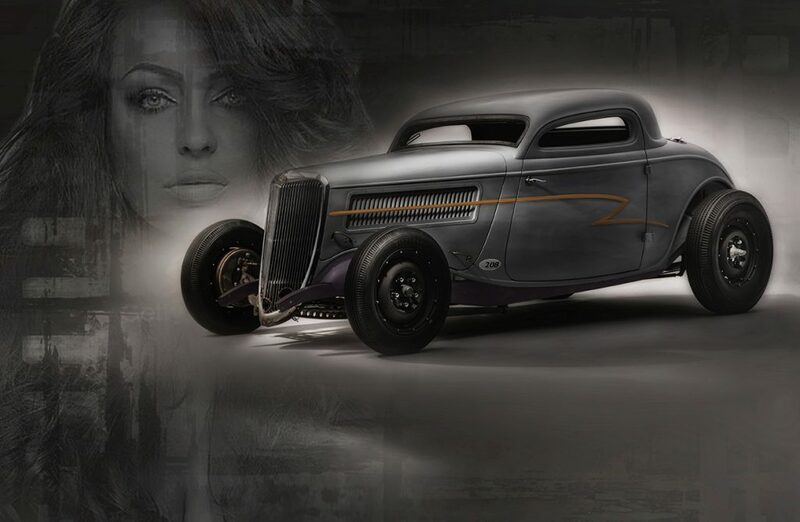 It has the iconic look of the Pierce Brothers Bonneville coupe that sets the bar for all ’34 3-window chops. The body was in really great condition and except for the custom touches by Jimmy Shine it was left alone and given a coat of PPG primer to prevent rust by Mike’s Paint. The car was built with post WWII parts reminiscent of what was taking place in garages and backyards across the nation in the early ‘50s. 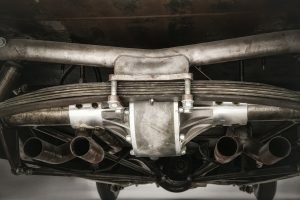 Sure, there were a couple of concessions for drivability and reliability such as a Vega steering box instead of an early Ford pickup, and a GM 350 Turbo Hydromantic replacing the original Cad 4-speed hydro. But they are out of sight and in no way detract from the build. The shiny new alternator and Holley carb were last minute fixes to get the car running for a last minute video shoot. Those and many other details are being re-addressed currently at Jimmy Shines shop. 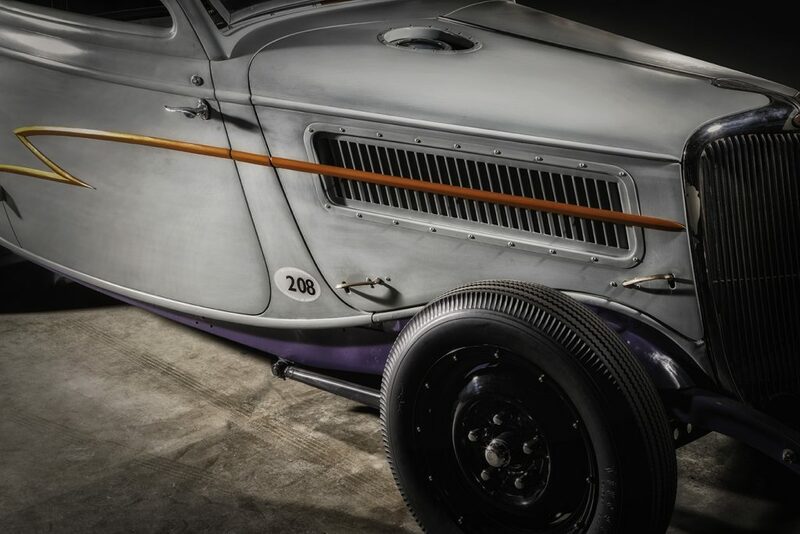 Another significant fact about this car is that it is the last to be built by good friend and So-Cal Speed Shop owner, Pete Chapouris who died suddenly and tragically after the Whisky Runner was completed. In fact, Pete filled out the tech sheet in his own handwriting that can be viewed in Rodding Revolutions feature story click here. A big part of Billy’s enjoyment with his car builds is commiserating about concepts and ideas to incorporate in the builds with his car-building buddies. If you check out the tech sheet on RR the first thing that hits you is that it is almost blank. Very few major modifications were needed. The ’34 frame got ’32 Ford frame horns grafted on front and rear. The transverse buggy spring suspension was retained with the original friction shocks replaced with So-Cal long tube units and a Winters banjo-style quick change with 4.11 gears was installed. A 22-gallon fuel tank was also mounted in the trunk area to give the coupe some range and running time. 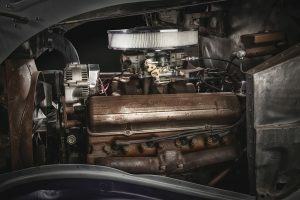 One of the parts of the Whisky Runner that Billy treasures most is the GM prototype 331cid OHV engine that Pete Chapouris had in storage for more than 20 years. Right at the end of WWII Pete’s dad was working with Ed Cline to develop a closed circuit engine dyno. GM provided them with three prototype Cad engines for testing. One engine eventually ended up in one of Cline’s cars, but Pete took possession of the “Cline Cadillac” in the end. The engine was carefully freshened up by Ray Zeller in Phoenix, Arizona, retaining as many as the original parts as possible. The clean, competition silhouette was achieved by recessing the headlights behind the grille and the taillights flush with the body. The unusual-looking hood side-panel louvers are from a ’36 Ford. One of Billy’s eccentricities is finding weird mechanical things and incorporating them in his cars. A good example is a 24V aircraft landing light that flips up on special occasions (like the 2014 SEMA Ignited parade). One such other odd piece is the helicopter control stick that Billy found in aircraft surplus. It now resides in the interior as the shift lever and looks right at home in the stripped out compartment. 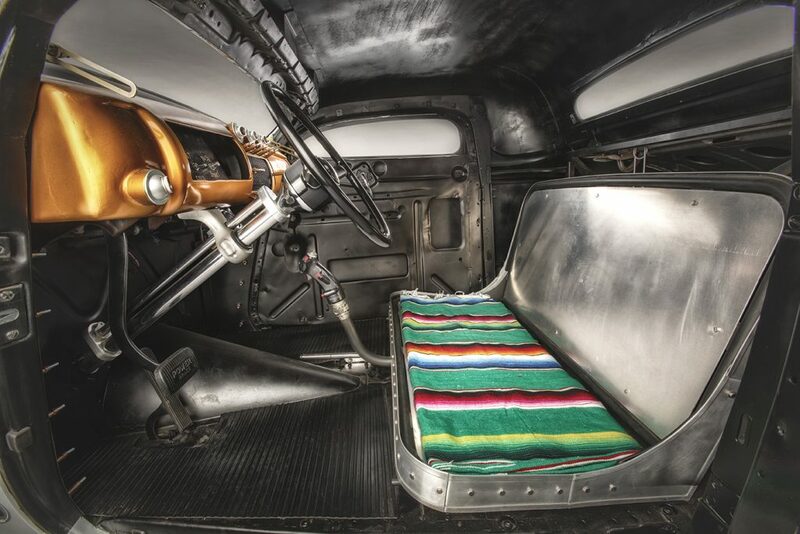 A ’40 Ford dash has been painted gold, but rubber floormats and the basis for a rudimentary bench seat is all that’s present. Other visuals that perfect the look are 12-inch drum brakes and 16-inch Ford steelies with 1-inch backspacing. They are 5s in front and 6s out back. BFG’s signature “Z” graphic was the final visual challenge is on the somewhat unrefined and primered body. That is until Billy decided to essentially “emboss” the body with a custom “Z” molding designed by artist Alberto Hernandez. It seems like a simple thing, but Billy says it was the most challenging part of the build. Since its completion, Whisky Runner (like Billy) has become a rock star, being featured in several videos and even a trip to the Goodwood Festival of Speed in the UK. But like we mentioned earlier, the car is back at Jimmy Shine’s getting ready as our old buddy Gray Baskerville use to call it, “a shave and haircut”. Who knows what phase II will bring, but we really like it just the way it is.